There has been much hype in America surrounding Wild, a new self help/self discovery style book by Cheryl Strayed . The book tracks her ambitious solo hike along the Pacific Crest Trail (PCT) on the West Coast of America which stretches from Mexico to Canada. The trail is more challenging but less well known than the Appalachian Trail (a 2100 mile trail from Georgia to Maine) which Bill Bryson wrote about in his A walk in the Woods, which was published in 1998 . This book inspired many Americans to hit the trail and get in shape! 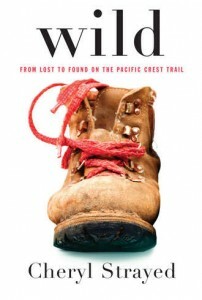 Wild is a true story by backpacking and hiking novice Cheryl who in the mid 1990s, aged 26, began her trek of 1100 miles on the PCT – from Mojave Desert through California and Oregan into Washington State .The trek took her through a wide variety of terrains and weather and she tackled it alone with ‘monster’ the name given to her incredibly heavy backpack! The three month trek provided a tough but immensely rewarding and healing experience for troubled Cheryl and has served as an inspiration for thousands of people – a film looks likely starring Reese Witherspoon and screen play written by Nick Hornby, of Fever Pitch fame. Not everyone would want quite this kind of challenge in their lives. Nor would they have the time to take it on. But the book certainly provides food for thought about long distance hiking in America and how it can offer you an amazing life changing experience. Backpacking requires taking everything you could possibly need with you – Cheryl got a friend to post supplies to Post Offices at various points along the trail but had to carry enough food and drink to last several days at a time. 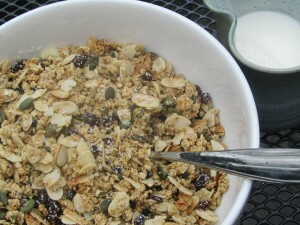 Her daily granola inspired me to include this granola recipe in our blog – a must for backpacking/ camping trips. It is packed with energy and goodness! Make your own granola or trail mix – we do! It is great for hiking and backpacking as it is light, full of nutrition and calories and easy to store. Add your own choice of nuts and seeds to a base of rolled oats, oil and sweetener (honey, syrup or sugar) and bake. Once cooled, combine dried fruit to make your own unique cereal. Climb it range granola – delicous and healthy to power your adventure!